Our founders laid the bricks on which we now stand. Their vision was for Skutt Catholic to become the premier Catholic high school in Nebraska. We have reached many of those new heights in academic success as well as excellence in the comprehensive extracurricular athletic and activity programs that teach our students to be well-rounded, contributing members of their community. 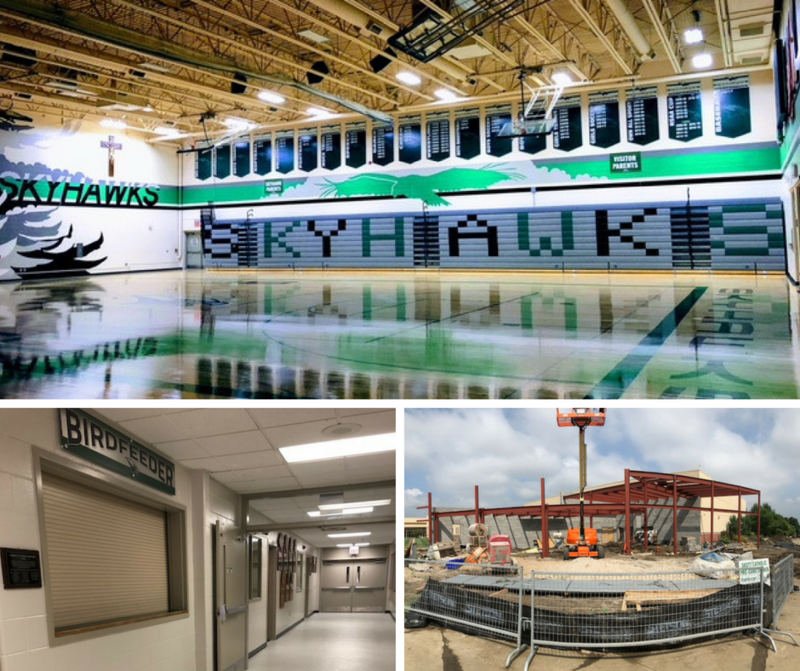 From football to show choir, and from robotics to SkyHawks for Life, there is an avenue for all students to create their own legacy at Skutt Catholic. This long-standing SkyHawk tradition of excellence set the path for each of us to create our own legacy at Skutt Catholic High School. Through the gift of planned giving you can be part of the SkyHawk Legacy Circle to ensure Skutt Catholic remains ready to prepare young men and women to become Christian leaders and Make a Difference in the world beyond high school. 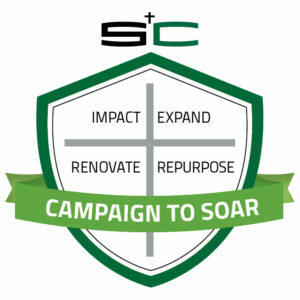 Over the next few months, President Moore and Mr. Schenk will be meeting with those who have already indicated interest in remembering Skutt Catholic in their planned giving during the Campaign to SOAR. For interest in a booklet providing details of various planned giving benefits please contact anthonyschenk@skuttcatholic.com. We appreciate your ongoing support. Your support has been overwhelming to this point, and we are $46,000 away from our milestone of $5 million dollars! WE can do this with your support. Every gift matters, and will “Make a Difference” for our community. Please send in your pledge by Hawktober 26 so we can celebrate our campaign success at Angel Flight on Hawktober 27. Be the difference in current and future SkyHawk students’ lives by sending in your pledge card from the sweep mailing or click here to complete your pledge today. Together let’s SOAR over $5 million, celebrate together and make our new classroom addition, school improvements, and endowment growth happen now! Thank you for your support and Go SkyHawks! Now is the time to send in your pledge as we are in the final 5-week push. Together, WE CAN raise the final $1.3 million by October 26! Please watch the latest campaign video with Msgr. Gilg on why it is important to help support the campaign and help us impact, expand, renovate and repurpose to give our students the excellence they deserve. Your support has been overwhelming to this point raising $4.7 million for our Campaign to SOAR. We are in our final 5-week push, as we look to celebrate the Campaign to SOAR at Angel Flight on October 27. Please send in your pledge forms today or click here to make your pledge online. Contact Jeremy Moore at jeremymoore@skuttcatholic.com for additional information. We are blessed to receive so many pledges to the Campaign to SOAR. These individuals have made a financial commitment to Skutt Catholic as we expand and renovate our school for the next generation of SkyHawks. We are now just $1.3 million from reaching our goal of $6 million to complete all planned projects. While we are thankful to those who have contributed, we encourage those still considering a pledge to prayerfully consider finalizing your gift. We need EVERYONE on board to push us over the top. Click HERE to make your pledge today. If you have a SkyHawk alumni in your family, encourage them to join the Cornerstone Club with a pledge of at least $250 over three years. The first 250 members will receive a Cornerstone Club commemorative quarter zip pullover and be recognized on a plaque in the new classroom addition. Construction on the new entrance is progressing with the exterior structure nearly finished. Completion is expected by Hawktober 12. The new bleachers are now in and ready for fans. It is great to have our main gym back! Make sure to follow Skutt Catholic on Twitter, Facebook and Snapchat for updates on all school happenings. If you wish to volunteer to help us finish up this transformation effort, please contact Anthony Schenk at anthonyschenk@skuttcatolic.com to learn more. Please take a moment to watch our August campaign update. Because of your generous support for our students and school, we are only $1.4 million from making the vision a reality! Thank you! If you have not already done so, please prayerfully consider a gift to the campaign and return your completed pledge card today or just fill out the Online Pledge Form. CHALLENGE HIT OUT OF THE PARK! The $250,000 matching gift challenge last week created an overwhelming response. We received $360,000 in pledges to put the total funds raised at nearly $4.2 million. See the video from Mr. Moore below for more on the campaign progress. We are now just $1.8 million away from our overall goal of $6 million to complete all campaign projects. You can help us reach our next milestone goal of $5 million by Labor Day. Every pledge, large or small, will help us reach our goal. The classroom addition is moving forward, but now we need the funds to complete the renovations to the academic space and classroom repurposing. The endowment goal of $500,000 has been funded with a percentage of each pledge and will be fully funded when we reach our goal. Please consider your gift to the campaign and return your completed pledge card today or just fill out the Online Pledge Form. JULY UPDATE – WE NEED YOU! The Campaign to SOAR has raised more than $3.5 million of our overall goal of $6 million. Our leadership team has stepped up with nearly $260,000. A group of 20 benefactors have lived up to the label of “Lead Gift Donor” with more than $2 million in gifts and pledges. The staff at Skutt Catholic have also stepped up in a major way by contributing over $100,000. This support is vital to the success of the Campaign to SOAR. This week we launched our final wave of the campaign, mailing campaign materials and request letters to alumni and alumni parents. To reach our goal, we need participation from EVERYONE in the Skutt Catholic community. Your individual effort, no matter the amount, will “Make a Difference” daily in the lives of our students, teachers, and families. Together we will Impact – Expand – Renovate – Repurpose! Please prayerfully consider how you can contribute to the Campaign to SOAR. Click here to make your pledge today. *Make sure you have the sound on when you watch the video update. Great things are happening with the Campaign to SOAR! We just passed the $3.25 million mark in pledges and gifts! Our leadership team, board of directors and lead gift donors have truly led by example and stepped up early and made their commitments to the campaign. Now we need the rest of the Skutt Catholic community to join the effort. Click here to complete the online pledge form. We are $250,000 away from our July 1 Challenge Goal of $3.5 million. Summer is here and so are the construction workers. We were excited to see the old south entrance come tumbling down, making way for our new secure entrance. Bleachers have been removed and new AC units and controllers are being installed each day. Our challenge goal of $3.5 million by July 1 is very important. Reaching this level will allow us to go forward with the design and bid stages for the classroom addition and other projects to be completed next summer. Much preparation time is needed for projects of this magnitude and hitting this goal is key to staying on schedule. We are over halfway to our Victory Goal of $6 million, which will allow us to accomplish all of our Campaign to SOAR goals. We are encouraged by the early support of the entire community. As we continue to build upon this historic effort, we ask you to reflect and pray about your involvement. We need to be sure we have done all that we can, individually and as a community, to realize the vision of our school. We encourage all who received a letter and a pledge card in the mail to prayerfully consider a personal gift. Please fill out the card and return it to the advancement office. Every contribution brings us closer to accomplishing our goals. Volunteers may also be calling about the campaign; we ask that you please be responsive to their call. For more information contact Jeremy J. Moore at jeremymoore@skuttcatholic.com. June 7, 2018 – Great things are happening with the Campaign to SOAR! We just passed the $3 million mark in pledges and gifts! Our leadership team, board of directors and lead gift donors have truly led by example and stepped up early and made their commitments to the campaign. Now we need the rest of the Skutt Catholic community to join the effort with their commitments. We are $1 million away from our July 1 Challenge Goal of $4 million. What once was there now isn’t. Work is off to a fast start on for the Campaign to SOAR. Summer is here and so are the construction workers. We are excited to see the old south entrance come tumbling down making way for our new secure entrance. Bleachers have been removed and new AC units and controllers are being installed each day. Our challenge goal of $4 million by July 1 is very important. Reaching this level allows us go forward with the final design and bid stages for the classroom addition and other projects to be completed next summer. Much preparation time is needed for projects of this magnitude and hitting this goal is key to staying on schedule. We are also half of the way to our Victory Goal of $6 million, which will allow us to accomplish all of our Campaign to SOAR goals. Volunteers may also be calling about the campaign; we ask that you please be responsive to their call. For more information on the campaign please contact Jeremy J. Moore at jeremymoore@skuttcatholic.com. May 2018 – Our Campaign to SOAR is off to an outstanding start. To date, we have raised more than $2 million in pledges and gifts to the campaign, surpassing our initial Celebration Goal of $1.5 million. That means we are halfway to our July 1 Challenge Goal of $4 million. Surpassing the Challenge Goal will allow us to move forward with the planning stages and push toward the expansion and renovation portions of our Campaign to SOAR. We are also one-third of the way to our Victory Goal of $6 million, which will allow us to accomplish all of our Campaign to SOAR goals. Volunteers may also be calling about the campaign; we ask that you please be responsive to their call. April 2018 – Please join us to hear about the exciting things are on the immediate horizon for Skutt Catholic High School. There are some BIG things you will see as early as the start of next school year. So, RSVP to learn more about the capital campaign as we share news of this transformative effort with our current parents and grandparents.